It’s been a long time coming for this blogger to discuss the prestigious Chicago Marathon. Tracking trends across Google and social media platforms has lead me to discover a bounty of new restaurants, festivals, events and other experiences that make our historic city the wonder that it is. 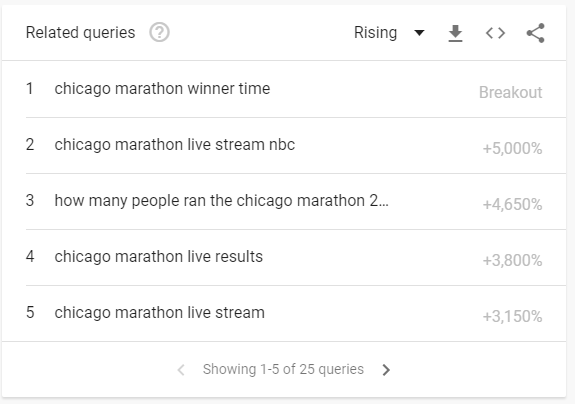 Since I started this blog over two months ago, the Chicago Marathon has been trending almost every single week. It’s been such a powerfully unifying and positive topic for both locals and participants across the world. 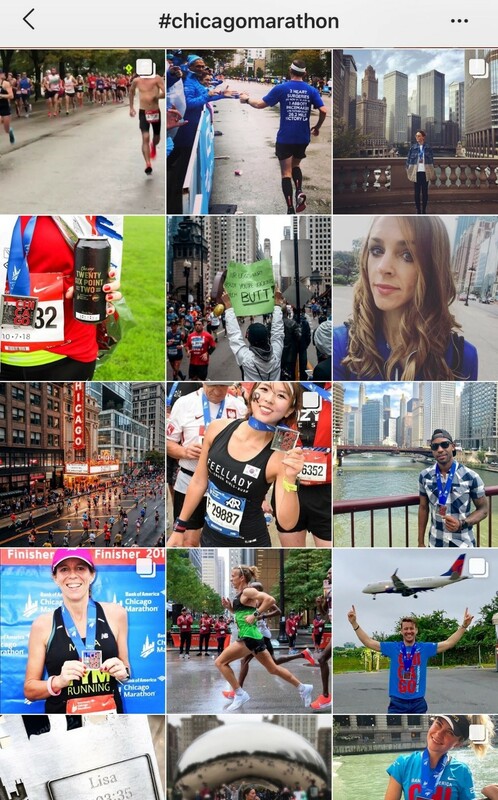 Instagram in particular served as a megaphone of free publicity for the race, as athletes training for the race over the past 12 months posted pictures of their training progress. The post-race celebration after the race became a city sized photo shoot for participants and spectators alike. As for the actual race, Great Britain’s Sir Mo Farah overcame Ethiopian Mosinet Geremew in the last half mile in the rain and wind in 2 hours, 5 minutes, 11 seconds to win the 41st annual event. “The women’s race was more of a coronation as Kenyan Brigid Kosgei separated from the lead pack at 20 miles and pulled away to win in 2:18:36, third-fastest in Chicago history. Kosgei, who finished second last year, beat her personal record (2:20:13) by nearly two minutes.” The race was summarized here by the Chicago Tribune. Chicago tends to produce famous figures, plenty of whom have been known to be generous in giving back to the neighborhoods that produced them. 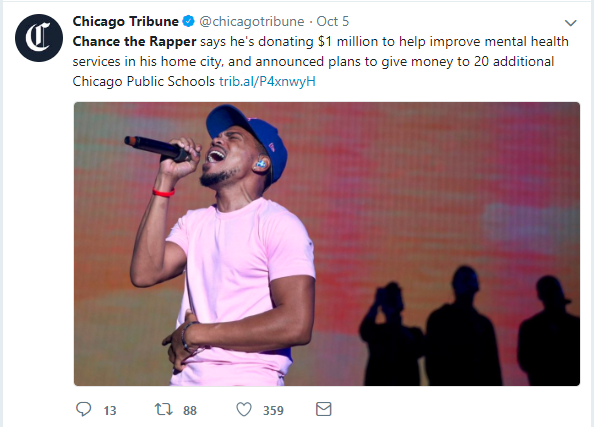 The most recent of which being Chance the Rapper, known locally as Chancellor Bennett, who is giving the city of Chicago $1,000,000 for mental health services. 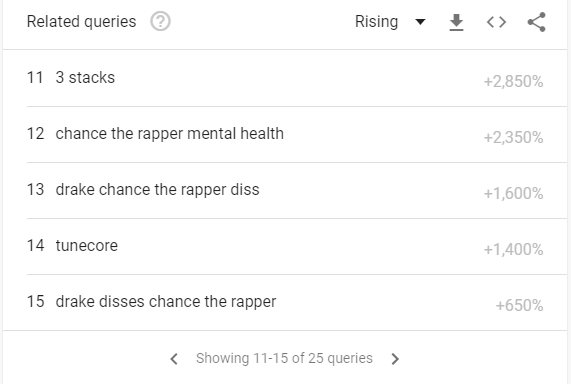 “We want to change the way that mental health resources are being accessed,” Chance said. “We need a new space where people can get information on how they feel, on where to go and a network for us to interact and review our mental health spaces, and create a community of people helping people” Bennett said in an interview with the Huffington Post. Chance has a history of supporting his hometown, specifically schools and teachers, in the wake of ongoing and devastating budget crises across the state. In 2017 he came back to throw his 25th birthday at LiqrBox, bringing an entourage of DJ’s, celebrities and other famous guests with 100% of the proceeds going to support his local charities. Earlier in the year Chance partnered with a Brooklyn based bag retailer to outfit 30,000 kids from Chicago with new backpacks before the school year. Long story short, Chance is a great ambassador of the city and we’re proud to have him. You can give to his foundation here. 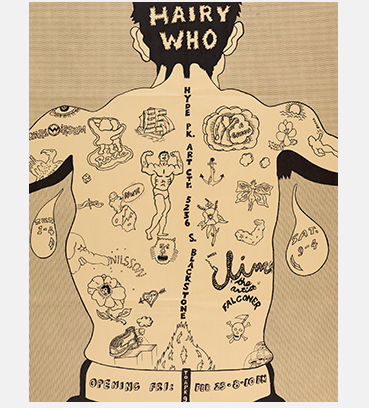 In 1966, School of the Art Institute graduates Jim Falconer, Art Green, Gladys Nilsson, Jim Nutt, Suellen Rocca and Karl Wirsum became a unified under the moniker of “Hairy Who” This signified the beginning of a historic movement in the Chicago culture scene. Five shows later, “Hairy Who” had created an adventurous and loud new style of art, drawing inspiration from by anything form graffiti to comic books. This week at the Art Institute of Chicago, visitors will have access to Hairy’s work, some of which hasn’t been viewed by the public since the 1960’s. The exhibit will borrow from the original presentation techniques used by Hairy Who (covering the gallery walls with linoleum, for example), and the Chicago Imagists movement. You can see a breakdown of the individual artist’s body of work, and reserve your tickets to show at the official website for the Art Institute of Chicago. Second City? Not By Our Count. Each year Conde Nast readers submit hundreds and thousands of votes for the best cities in the US. Small and large, based off of a wide variety of categories and parameters. Chicago, for the second year in a row, has finished at the top of the list. Called “world-class in so many categories-magnificent architecture, stunning museums, brilliant chefs, a massive brewing scene, with so much to do you’ll never see it all,” the people have truly spoken. Whether it’s the excitement of the loop, the beauty of the Gold Coast, or the rich tradition of any of the 77 neighborhoods the Windy City has to offer, travelers the world over flock to the Windy City every year to get a small taste of what we get to experience regularly. Behind Chicago were the expected metropolis cities, New York, New Orleans, San Francisco, Honolulu, San Antonio, San Diego, Seattle, Portland and Boston. 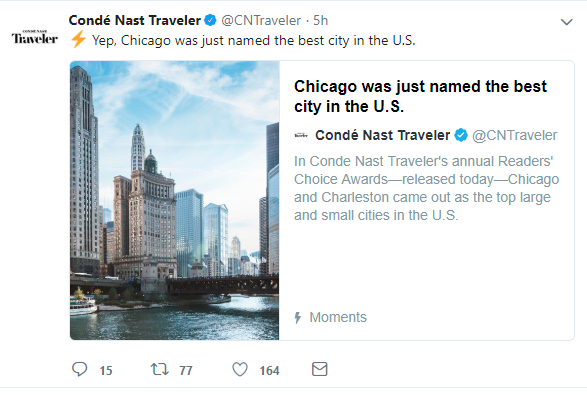 Due to an overwhelming increase in voters this year, Conde Nast elected to break out the competition into categories, big city and small city. The darling of Southeast, Charleston, S.C. took home the top honors in the smaller category. Alongside of the smaller treasure towns that help make America so special. You can view the entire list here. We’re certainly proud of our city, and proud to live here, so many different factors go into making Chicago the greatest city in the country, eat your hearts out New York!